Latest updates on the political upheaval in Egypt. 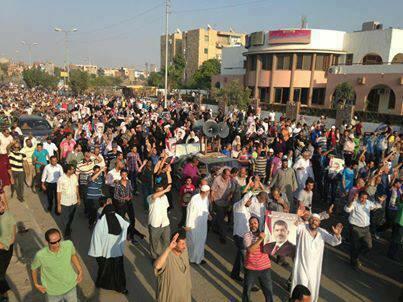 More Brotherhood protests today, in Cairo, Minya & elsewhere around #Egypt . Crazy amount of unrest. 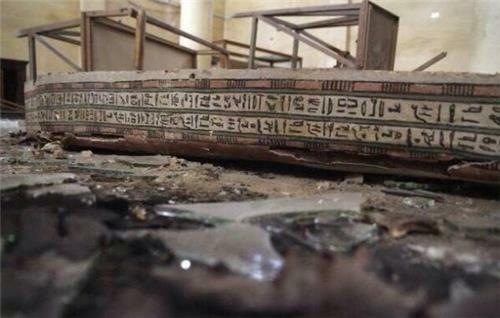 The Malawi National Museum in Minya, Egypt was looted on Wednesday, and archaeologist Dr. Monica Hanna told Reuters on Thursday that the eastern desert road south to Minya was blocked by Egypt's government forces, and the western road was unsafe to travel. The Associated Press visited the Malawi Museum, and collected a series of stunning yet tragic photos that show the destruction. Read the full AP account here (photo below). Hanna told Reuters on Thursday that more than 1,000 artifacts held in high regard by the international Egyptian archaeologist and historian community were taken from the Museum. 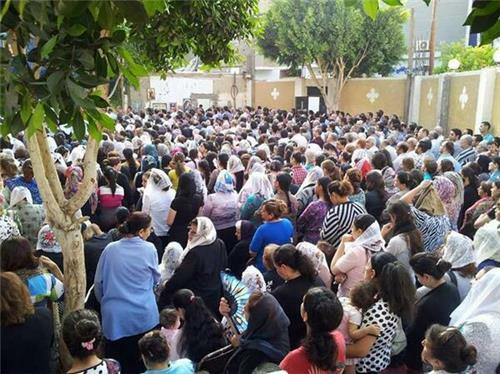 The community, with Hanna, are using on-the-ground contacts and social media sites like Facebook and Twitter to collect reports, photos, and video of attacks against Christian (Coptic) churches, schools, and orphanages. CAIRO - At least 24 Egyptian policemen were killed in an explosion on Monday near the North Sinai town of Rafah, medical and security sources said. The blast also wounded three policemen. Attacks by Islamist militants in the lawless north Sinai region have intensified since the army overthrew Islamist President Mohamed Mursi on July 3. CAIRO - Hosni Mubarak, the former Egyptian president overthrown in an uprising in 2011, will be released from jail in the next 48 hours after a prosecutor cleared him in a corruption case, his lawyer Fareed El-Deeb has told Reuters. Mubarak, 85, still faces a retrial on charges of complicity in the murder of protesters during the 2011 revolt. KUWAIT - Kuwait plans to deport nine Egyptians who demonstrated against the Egyptian army crackdown on the Muslim Brotherhood that has killed hundreds of people, a security source said on Monday. Kuwait, a major oil exporter allied to the United States, gave Egypt $4 billion in aid last month. It was part of a $12 billion package offered by Gulf Arab states to shore up Egypt's economy after the army ousted the country's first freely elected president, the Brotherhood's Mohamed Mursi, following protests against his rule. Dozens of Egyptians joined Kuwaiti activists who had organised demonstrations at the Egyptian Consulate and the U.S. Embassy in Kuwait last week to protest against the deaths caused by the forcible breaking up of pro-Mursi protest camps in Cairo. The security source, who declined to be identified, said the nine slated for deportation were "prominent participants suspected of incitement and chanting hostile slogans". He did not rule out further expulsions, saying the investigation was still going on. Gulf Arab states often show little tolerance towards expatriates taking part in unlicensed protests. "For us, gatherings are banned, regardless of the reasons or the motives behind them," the security source told Reuters. European Union foreign ministers will hold an emergency meeting in Brussels on Wednesday to discuss the situation in Egypt, an EU spokesman says. In his full-throated cry of support for the Egyptian authorities, Saudi King Abdullah on Friday described street protests by the Muslim Brotherhood as representing "terrorism and sedition". That stark view of a crisis that has killed hundreds in the past week shows why the world's top oil exporter will continue to back Egypt's crackdown on the Brotherhood even while its Western allies try to convince the generals to back down. When the "Arab Spring" revolts blew across the Middle East in 2011 - toppling one authoritarian president after another - the kings and emirs of the rich Gulf monarchies held on to power but were shaken as never before. One of King Abdullah's nephews, Mecca Governor Prince Khaled al-Faisal, decried the uprisings in a poem as a "dust storm sweeping Arab lands" in which traditional rulers had been defamed as "backward, reactionary and barbaric". Two years later, those same rulers now see a chance to restore the stable order that had held for generations in the region, and are determined to spend their oil billions to bring back trusted friends. Some EU governments are reluctant to take steps that may have a deeper impact on the population than on the government, diplomats say. The European Union's ability to exert immediate economic pressure on Cairo is limited - much of its aid has been already stopped because of inadequate democratic reforms. Senior EU official Leon says an arms embargo against Egypt is one option being discussed by EU foreign ministers. 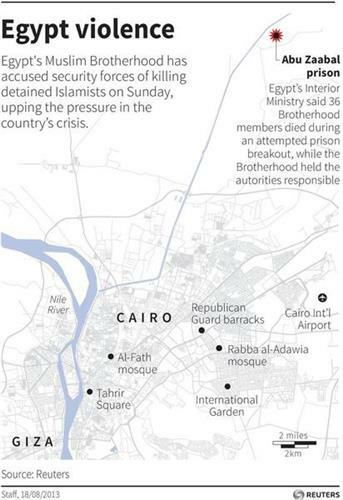 The New York Times has published a summary of recent events in Egypt since Saturday. An excerpt::"Just in the past 24 hours, the Egyptian government has acknowledged that its security forces had killed 36 Islamists in its custody, while suspected militants were reported on Monday to have killed at least 24 police officers and wounded 3 others in an attack on their minibuses in the restive northern Sinai region." 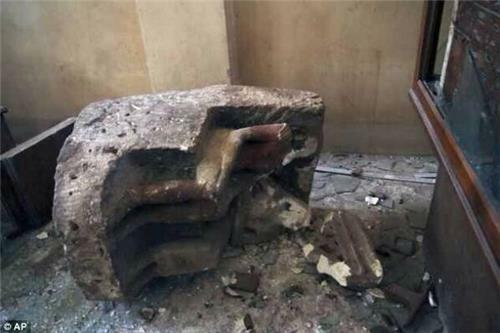 An incredible report by the Egypt Independent: churches in Minya canceled Sunday mass services for the first time in 1,600 years after days of attacks and destruction. Reuters Video: An army-enforced dusk-to-dawn curfew returned Sunday as the military and interim government leadership pledged to protect Egypt. Nathan Frandino reports that enforcing a dusk-to-dawn curfew, army soldiers in Cairo manned checkpoints and inspect cars for weapons after days of violence. The U.S. State Department voiced deep concern on Monday about the deaths of Muslim Brotherhood prisoners while in custody in Egypt and made clear that it does not believe that the Islamist group should be banned. "We are also deeply troubled by the suspicious deaths of Muslim Brotherhood prisoners in a purported prison escape attempt near Cairo," State Department spokeswoman Jen Psaki told reporters, referring to some 38 Muslim Brotherhood supporters who died in disputed circumstances at a prison on Sunday. Public Backs Cutoff of Military Aid to Egypt: the Pew Research Center reports that 51% of Americans say it is better for the United States to cut off military aid to Egypt to put pressure on the government. This is nearly double the percentage (26%) saying it is better to continue military aid to the government in order to maintain influence in Egypt. Foreign ministers from the European Union's 28 member states will meet in emergency session on Wednesday to discuss aid and arms sales to Egypt, reports EuropeanVoice.com. 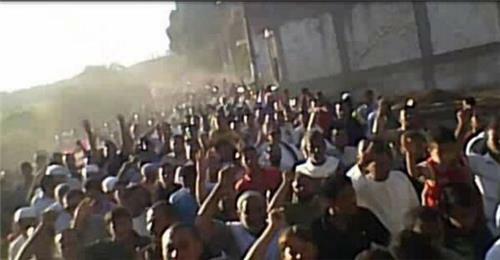 The AP reports: "Last Wednesday, nearly 600 people were killed throughout Egypt in violence that accompanied the forcible dispersal by security forces of two Cairo protest camps. ... On Monday, five days later, the bodies of dozens of those killed in the Rabaa al-Adawiya protest camp remain at the morgue. ... Among the relatives are those who don't yet know if their loved ones are inside the morgue. Others have identified bodies, but are still waiting for them to be processed."